Railway Photography by Phil Trotter - Blog: Memories of SWT in the '50s and '60s. My name is John Alun Evans and am now 73 years of age who at this special time feels it appropriate to document some of my memories of the South Wales Transport operation in the late forties, fifties and sixties when I lived in Morriston during the first 20 years of my life. The information is based on observations by myself and a late good friend Bill Joseph who spent many hours and sometimes days travelling around recording mentally anything relating to SWT vehicles of the time. Unfortunately cameras did not form a part of the pastime as such luxuries were only available to children of more wealthy parents. Nevertheless, the following represents observations between 1946 and 1960. Both Bill and I lived in Morriston and I was fortunate to live on a bend on Pentrepoeth Road before the Vicarage Road crossroads. In many cases buses slowed to walking pace at this good vantage point. This was particularly true with the occasional double decker Renown returning to the Depot at Ravenhill. 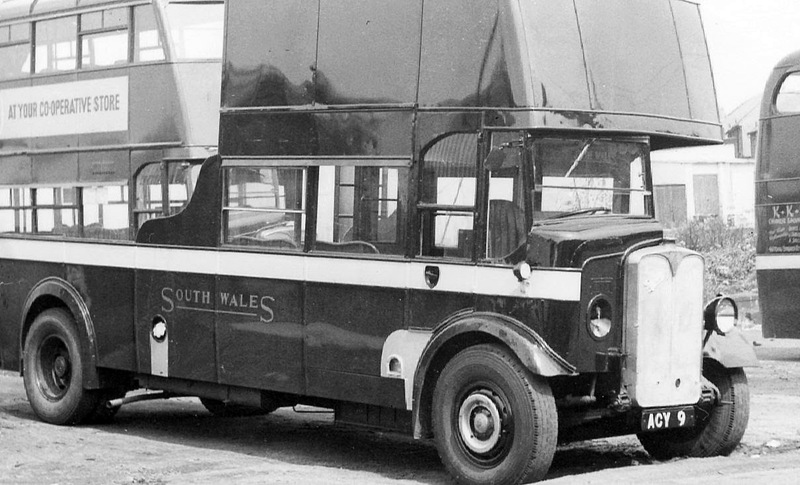 The road served a range of routes such as 26 Neath to Llanelli, 40 Sketty/Caswell Bay, 9 Swansea via Treboeth, 90 Clase to Swansea in addition to the Swan Motor services to Swansea via Caemawr Hill and Bryn Rock. 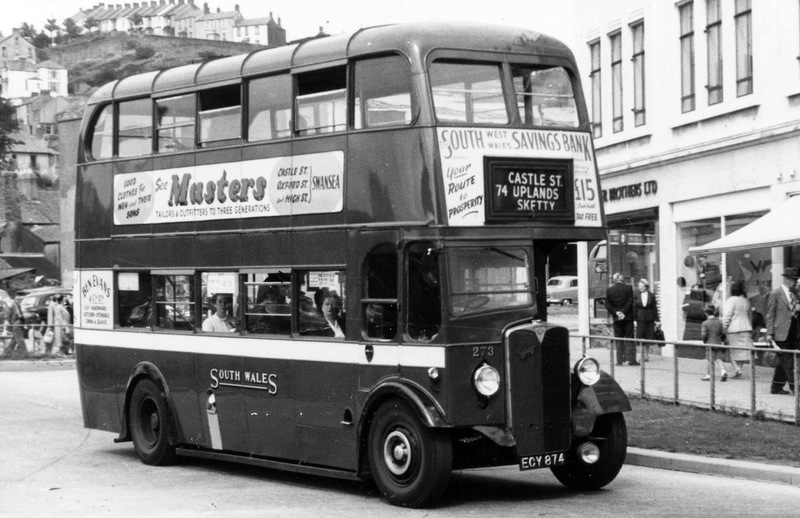 Morriston was also the terminus of route 71 to Swansea Exchange. In addition, route 77 Guildhall to Cwmrhydyceirw/ Pontlasse passed through Morriston Cross. My earliest memory was as an 8 year old waiting for the 71 bus in Waun Road and getting on one of the early 1937 High Bridge Weymanns ACY 4 with a producer gas trailer hitched to the rear. As this stop was one I frequently used to get to school at Martin St., other vehicles of this era such as ACY 21 to ACY 39 were all employed on the route in addition to some of the later AWNs such as AWN 554 and 557.
destroyed (by enemy action?) in 1940 and was rebodied in 1942. One of the ACY batch which always caused particular interest was ACY 27. Outwardly, this vehicle was of the same design as the others in the fleet but whilst the others had a protruding rectangular destination indicator this bus had a flush display with access via a hinged flap to the front upstairs. Furthermore, the vehicle had different seats which were brown in colour and an upstairs ceiling that seemed to be continually pitted with rust despite many attempts by SWT to eradicate the problem. Even so the vehicle survived well into the fifties long after the demise of ACY 24, 34 and 44 which were the first of the remaining 30 vehicles to be withdrawn in 1953. Regarding this, we were informed at the time that the rebuilding of these vehicles by Jefferies Garages at Plasmarl was inferior to SWT rebuilding and hence their earlier scrapping. A vehicle in this group of considerable notoriety was ACY 35. This vehicle was frequently despatched from Brunswick depot as a duplicate for the 4.05 pm 40 Morriston to cope with the extra pressure of students returning home from Bishop Gore school. Never once did the bus get beyond the top of Broadway hill. Steam used to issue from the cooling system in addition to loud ringing engine bearing noise. It is true to say that all regular passengers would refuse to board this bus if it turned up and wait for the scheduled service bus which was either an FWN HB or a 7' 6" GWN such as GWN 77. We could never understand why SWT persisted in sending this vehicle given its problems. What was more surprising however was that this bus survived for another 4 years being one of the last to be withdrawn in 1957 still with the same ringing bearing noise. a towing bus/tree lopper in 1952. Other memories included FWN 361 breaking down on Chemical Road on route 77 and being recovered by ACY 9, the vehicle which SWT had to hide for some reason when inspectors from the Transport Ministry visited the company! This incident also proved to be ironic in that FWN 361 eventually was cut down in the same style becoming its replacement in 1961. Another interesting observation involved the Swan fleet. In addition to the double deck Daimlers FCY 730-734 and GCY 740 and 741 there were two double deck HB AEC Regent vehicles with reg numbers FWN 636 and 637 which followed on from the five single deck Regals of SWT with Longwell Green bodies. We were never certain whether these two vehicles also with the same bodywork were originally destined for SWT and were purchased by Swan from SWT before delivery. Returning to our observations on Pentrepoeth Rd Morriston, and the vehicles used on routes 40 and 9, it is true to say that between 1946 and 1953 the routes were virtually all served by Lowbridge Leylands usually one of the third batch CCY970-CCY 995. One regular performer up to about 1949 was CCY 993 which carried an unfrozen High Bridge utility body. Apparently, this was a replacement for its original body destroyed in the Swansea blitz. Imagine our surprise when casually looking out of my window one morning in1952 to see the same vehicle on route 26 Neath with a conventional low bridge body! We could only surmise that it had received its body from one of the earlier batches BCY 576-611 or BWN 426-450 many of which had been withdrawn by this time. Regarding Route No 9, this was also served by LB Leylands up to their demise in 1953. At no time during this period was an ACY or AWN used on these routes which was surprising (except ACY 35 of course which as a duplicate never reached Morriston when on Route 40). After 1953 high bridge vehicles such as 1949 Regents FWN 357 and FWN 360-375 in addition to the narrow high bridge Regents GWN 73-81 were commonly used on these routes. One in particular (known as "all the threes" by drivers on the 40), FWN 371 always gave an outstanding performance on the hills involved and was a favourite with drivers. 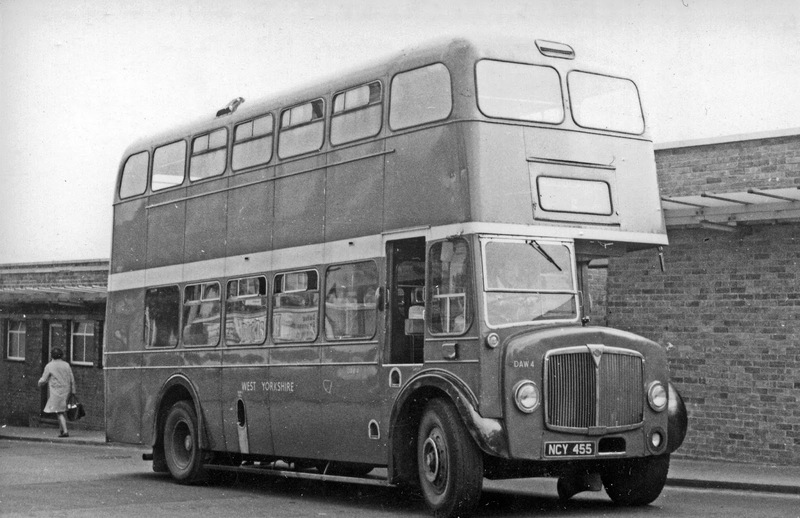 With regard to the 26 route, post 1953, low bridge Regent IIIs such as GCY 521-524 became the mainstays of the route. If my memory serves me right I believe these four were based at the Llanelli depot. involving an identity swop and a 'missing' chassis which later appeared as no. 305. As Sketty was the destination for pupils like myself attending Bishop Gore school, extra demand was placed on transport during the morning and afternoon. Brunswick depot always supplied the relief vehicles which took many forms. Vehicles included ACYs or AWNs or any other vehicles available such as LB EWNs (EWN 340-354). 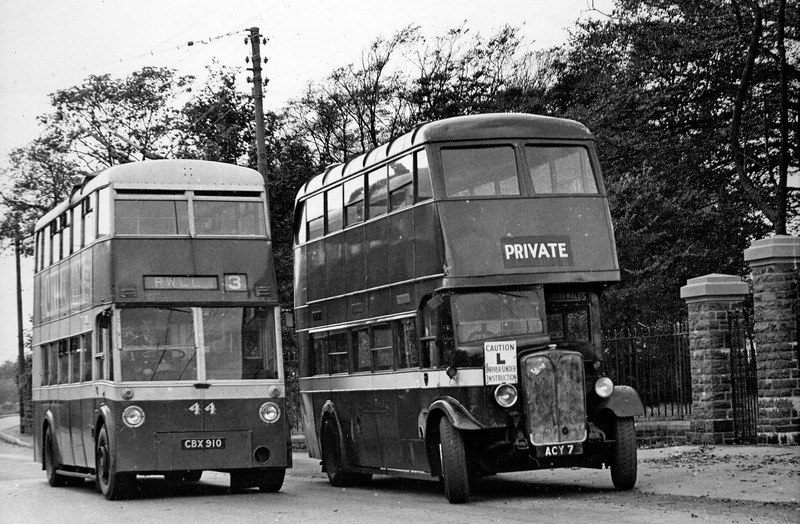 On occasions a single decker would be provided in the form of a Renown such as CCY 951-957 or CWN 395-398 (CWN 399 and CWN 400 had been withdrawn in the early fifties). A bus that frequently turned up was an ex Llanelli Regal ABX 80 which had been allocated to Brunswick depot. Another vehicle often used for this work was the ex-Johns single decker Leyland BNY 671. A real surprise however,in 1955 was a Leyland Tiger TS7 of 1935 vintage WN 7757 which seemed in immaculate condition given its age. on service 28 to Brecon. With regard to withdrawn buses, we often saved our pocket money to finance our travel at weekends looking for abandoned vehicles in farmyards and fields (no parent today would allow 9-12 year olds to do this unsupervised). One very productive Saturday in 1952 was spent in Pontlliw and Grovesend. In Pontlliw we discovered Renown CWN 400 in Rosser`s yard. Rosser operated a fleet of quite antiquated AEC vehicles used mainly to transport coils of tinplate from Port Talbot to Velindre for cold rolling. We could only conclude that Rosser had secured the bus from SWT for its 9.9 litre engine which was missing. On moving on to Grovesend in the afternoon, we first came across the high bridge Regent ACY 10 in a back garden of a house. We were invited in and shown the inside of the bus whose downstairs had been converted into a dress making workshop. We were told that the bus had been acquired in 1950 from SWT. 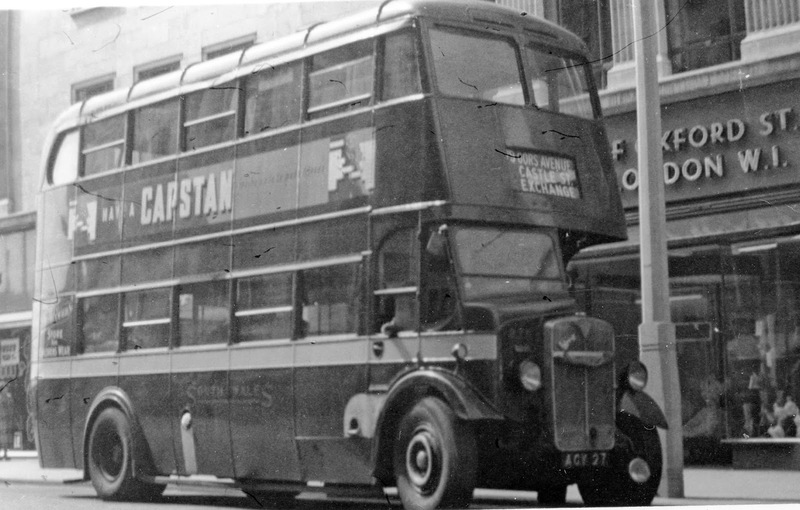 It was significant that the rear of the bus still possessed the post war British Buses motif. Walking further along some deserted woodland we came across a farm with an SWT bus used to house chickens. We again knocked the door and were invited in and shown around a Dennis Lancet, CCY 960 which was acquired in 1949 from SWT. On we walked through fields until we came across a deserted LB Leyland BCY 610. This struck us as rather surprising at the time as BCY 611 the last member of the batch was still very mach in service having only recently been overhauled. Our final discovery however, was rather intriguing. In the distance we could see a rather faded red single decker with an oval rear window. By its appearance it had been there for quite a long time. On closer approach we were able to clearly identify the vehicle as a Dennis Lancet Reg no WN 8983 which was delivered to SWT in 1936. What puzzled us then was that we understood that all this fleet was acquired by the War Dept. in 1940 and were not seen by SWT again. 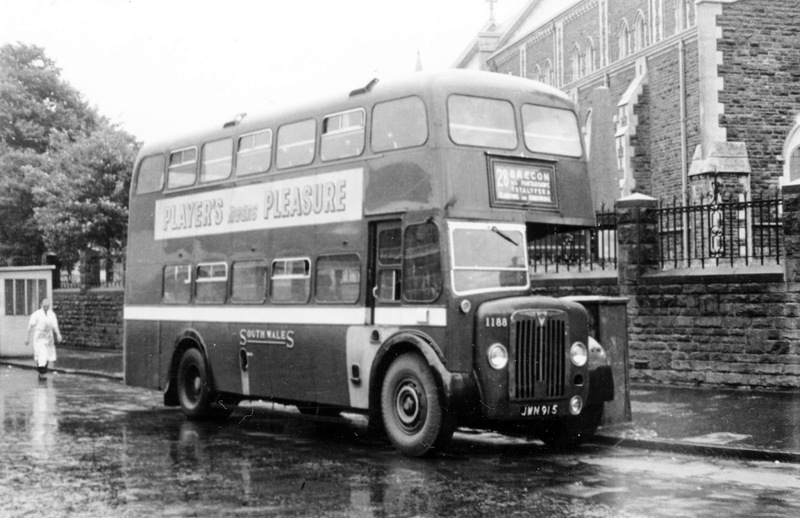 to work on motorbuses prior to the closure of the system in 1952. 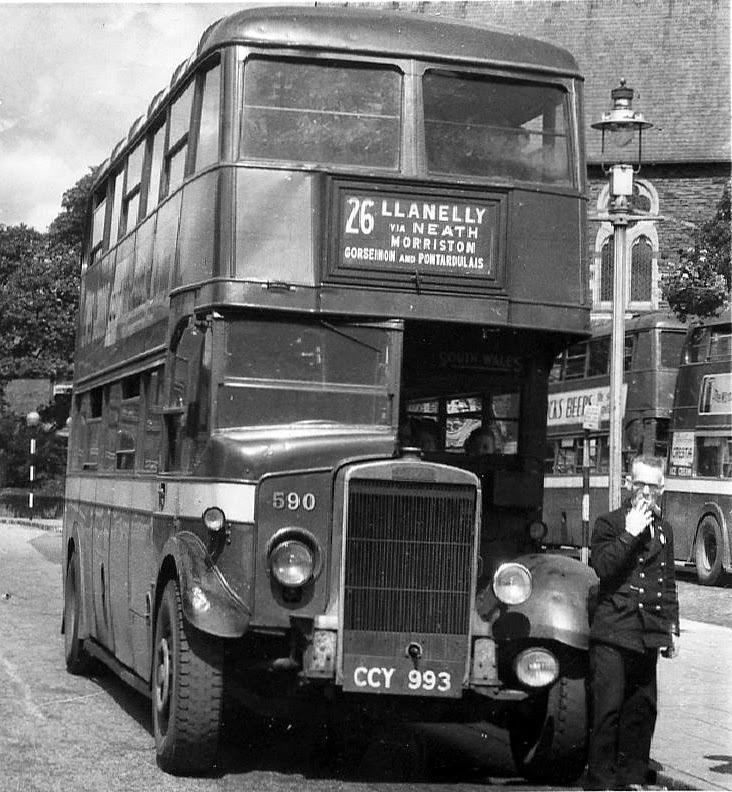 On another Saturday in 1952 we decided to take the 26 to Llanelli as we had been told by a mechanic at Ravenhill that a large number of the fleet had been transferred to Llanelli garage to replace the trolleybuses on local routes. 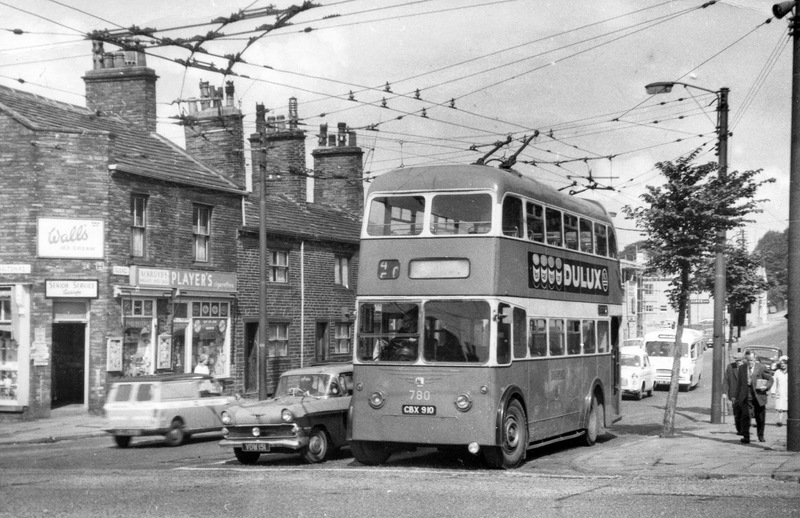 We did not know Llanelli had trolleybuses! We were therefore determined to find out which buses were at Llanelli. ACY 40 ACY 50 (although ACY 40 was returned to Ravenhill in 1955). FWN 352-356 and FWN 358-359 (for some reason FWN 357 remained a Ravenhill bus all its life. GWN 82-85 (these were the first of the 8 ft wide vehicles in the number series GWN 82-95). WN 7759 a sister Leyland single decker to WN 7757 based at Swansea was also spotted in very poor condition. In addition to these there were, we were told of eight new HB AEC Regents although we did not see any of them. These turned out to be HWN 837-844. With regard to single deckers none other than WN 7759 seemed to have been transferred. This visit turned out to be the most exciting experience of our bus spotting days. 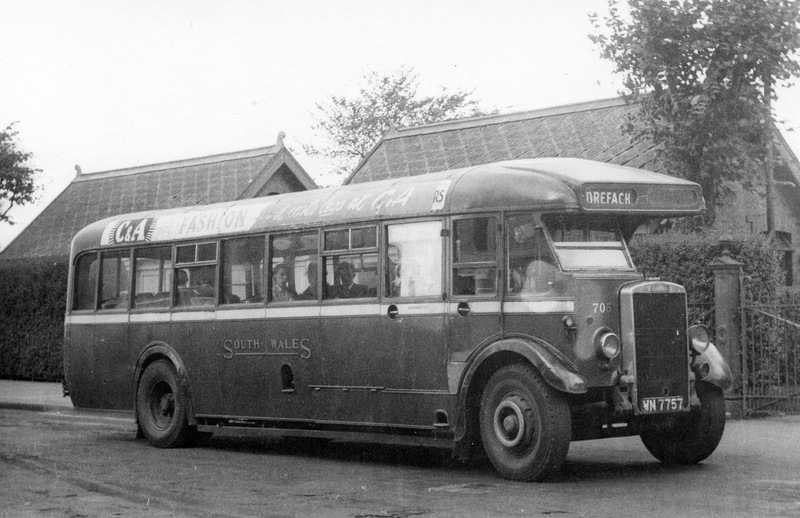 1935 Leyland TS7/Weymann357 (WN 7757) in service at Llanelli. It is now an appropriate point to describe my own experiences as a temporary conductor with SWT during the Summer of my student days at Swansea University between 1960 and 1961. At the time it was a policy of SWT to take on students to help with the extra passenger demand particularly on coastal routes such as routes 77, and 40. I was based at Ravenhill depot and worked on many routes such as 71 Exchange-Morriston, 77 Guildhall/ Mumbles Pier/Limeslade to Cwmrhydyceirw and Pontlasse (by this time the much lamented Mumbles Railway had closed and the track bed from Southend to the Pier had been converted to a 'buses only thoroughfare' enabling buses to carry out a three point turn at the Pier for the return trip). Other routes I worked included 79 Gorse Avenue-Exchange, 23 Penlan-Exchange, 84 Blaen-Y-Maes-Exchange, 40 Morriston-Sketty or Caswell Bay, 24 Swansea-Porthcawl, 42 Swansea- Margam. In addition I was called to fill in as a relief or cover an absence of a regular member of staff on a particular route at short notice. I have many pleasant memories of this period in my life some of which were quite humorous. One of the former was accompanying a very good and helpful driver Jack Hughes on No 77 Pontlasse to Mumbles Pier early one morning. It was fortunate that Jack had warned me in advance regarding the severity of the brakes on our virtually new 1961 front entrance AEC Regent YCY 901! Nevertheless it was a pleasant experience at the Pier watching the sun rise over the bay at 5.30 in the morning. An amusing situation occurred on my first day out when I had to relieve a crew at the Exchange on the no 23 Penlan. I remember the bus well, a 1956 Regent with exposed rear platform NCY 455 a Weymann of the batch NCY 451-471. My driver Cyril Jones was forced to make an unscheduled stop outside Lewis Lewis in the High Street to come to my rescue and ask the eight or so people who were standing upstairs to get off. This taught me a salutary lesson in passenger control very early on. Another very amusing but embarrassing incident took place at the traffic lights outside Woolworths on the High St. Apparently as I found out to my cost, it was customary for the conductor of a bus with rear entrance to lean out and change the destination indicator of a following bus to save time doing it at the Exchange. Well, this I attempted but whilst I was trying to find 79 Gors Avenue, my driver pulled away when the lights turned green leaving me hanging on to the destination indicator handle of the bus behind! Needless to say this bus had two conductors for the last stage of the journey! Bradford after rebodying by East Lancs..
My memories of SWT would not be complete without some reference to the Bradford connection. In 1966 I moved to the University of Bradford to take up a lecturing post in Chemistry. Little did I realise at that time that SWT had forestalled me. My first encounter was with an immaculately turned out ex Llanelli trolleybus CBX 910 which seemed to be in good company with a number of its brothers although some were not in such good condition. This fleet had obviously been re bodied on acquisition in 1952. Ledguard, Leeds in 1967 and thence to West Yorkshire. My second surprise which I could hardly believe my eyes involved a visit to the shops at Leeds in 1967. On casually walking along the Headrow, a rear entrance HB AEC Regent caught my eye. This was ex SWT NCY 455 in red West Yorkshire livery which was the very bus on which I started my SWT conducting. Although I had been aware that the Leeds firm Samuel Ledgard had purchased many ex SWT vehicles in the past, I felt it to be quite fortuitous that I should see not only the vehicle I had known so well, but to witness it at a time shortly after Ledgard had been absorbed into West Yorkshire. In 1968 I moved to Leicester and have remained there ever since. Although my interests switched to the Leicester City Transport operation and its buses of the past, I have always kept in touch with developments on the SWT front particularly the sterling work currently being carried out by the South Wales Transport Preservation Society based at Swansea. In this respect a continual source of disappointment to me is the fact that despite its very large post war fleet no vehicles prior to the preserved ex Llanelli based HB Regent 5 MCY 407 seem to have survived. I therefore live in hope that one day I will hear that ACY 25 or BCY 585 will have been discovered languishing on a farm or field and was scheduled for preservation! "Salt of the earth" indeed! I remember as a very raw student conductor in 1969 conducting the last trip to Penyfan on a Saturday night. About a dozen boarded on Murray Street and I took most of their fares, but at the next stop we were overwhelmed with a full standing load and I decided not to try and get round the bus, but to get the fares as they got off (unlike some conductors I fully intended to issue tickets!). But when we started setting down I was met with a succession of "I've paid" (which I couldn't dispute as I had taken some fares) or "He's getting mine" - pointing behind. They obviously recognised me as a new and not very brave conductor and took full advantage! what a fantastic story you have explained everything in perfect bus man language, I have been a bus fanatic since 1951 when my father a conductor used to take me to the garages to sit in most of the buses you have mentioned, i also worked as a conductor from 1966 to 1971, I have been collecting S.W.T. photos for over 25 years and have over two thousand photos however one has always eluded me until now A.C.Y. 27, I have always lived up Gorse Avenue and to see 79 on the front is brilliant.